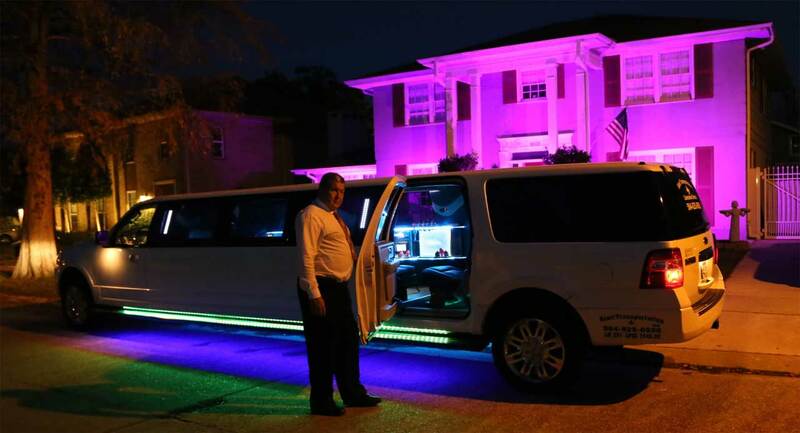 Alert Transportation provides the Best New Orleans Limousines Service. Travel comfortably in Alert Transportation’s chauffeured vehicles from limousines to limo buses. New Orleans international Airport, Signature Aviation, Millionaire Airlines and Atlantic Aviation. Alert Transportation is licensed by the City of New Orleans & Louisiana Public Service Commission, all drivers are CDL certified. All our vehicles are air conditioned and driven by courteous, attentive, and professional drivers. Alert Transportation is licensed by the City of New Orleans and the Louisiana Public Service Commission. All our drivers are professional and CDL certified. Alert Transportation's Handicap Lift Van sits up to three passengers plus a person in a wheel chair. Alert Transportation offer services for the mobility impaired with our Handicap Lift Van. Call 504-362-4145 – day or night for pricing. We provide Corporate, Business, Social, Prom, and more transportation with safe professional drivers. Alert Transportation is locally owned, family run company that has been in operation since 1999. SAVE $’s by using 2 or more Limos and/or Rolls Royce + a free bottle of Champagne for the Bride and Groom. Alert Transportation offers Special Wedding Packages for 2.5 hours – Additional time is available. When you call Alert Transportation, you get a real person, not a reservation website. We are a locally owned, family-run company that provides in offering the best customer service. Since 1999, Alert Transportation has provided the best private transportation services with a wide-variety of beautifully maintained vehicles to choose from. We have two Antique Rolls Royce motor vehicles, black and white Limousines, Limo Buses, and even Party Buses. Call Alert Transportation and reserve your private, chauffeured vehicle today. I want to thank you for the excellent service your company provided on Friday for my daughters wedding. The bus arrived on time and was in excellent condition. The bus was clean on the inside and outside. The traffic conditions were particularly bad in the area of the city that was our destination that evening. Your driver and i discussed ways to avoid traffic and get us to the destination on time and she did a fantastic job. I do not remember her name but she was great not only showing she knew how to get us ther but also in attending to the parties on the bus. Thank her again for me. I would highly recommend your company.